THIS COVER DOES NOT FIT HD (HEAVY DUTY) FRAMES! 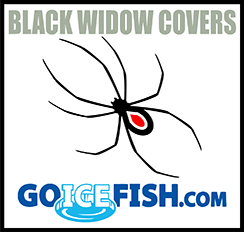 Black Widow covers offers a cover for all sizes of Fish houses. Our frame sizing is based on Ice Castle Fish Houses. Toy Hauler Door Cover 80"
Loved how fast we received our order, and how easy these were to install!